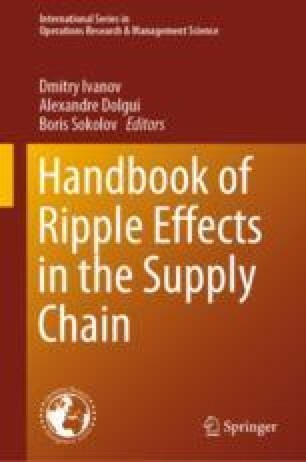 This chapter aims at delineating major features of the ripple effect and methodologies to mitigate the supply chain disruptions and recover in case of severe disruptions. It observes the reasons and mitigation strategies for the ripple effect in the supply chain and presents the ripple effect control framework that is comprised of redundancy, flexibility and resilience. Even though a variety of valuable insights has been developed in the given area in recent years, new research avenues and ripple effect taxonomies are identified for the near future. Two special directions are highlighted. The first direction is the supply chain risk analytics for disruption risks and the data-driven ripple effect control in supply chains. The second direction is the concept of low-certainty-need (LCN) supply chains. DHL. (2018). Retrieved February 4, 2018 from https://resilience360.com/. He, J., Alavifard, F., Ivanov, D., Jahani, H. (2018). A real-option approach to mitigate disruption risk in the supply chain. Omega. https://doi.org/10.1016/j.omega.2018.08.008. IBM. (2018). Retrieved February 11, 2018 from https://www.youtube.com/watch?v=tdhpYQCWnCw&t=52s. KPMG. (2017). Supply chain big data series. Retrieved February 17, 2018 from https://assets.kpmg.com/content/dam/kpmg/au/pdf/2017/big-data-shaping-supply-chains-of-tomorrow.pdf. Pavlov, A., Ivanov, D., Pavlov, D., Slinko, A. (2019). Optimization of network redundancy and contingency planning in sustainable and resilient supply chain resource management under conditions of structural dynamics. Annals of Operations Research. https://doi.org/10.1007/s10479-019-03182-6. RM. (2018). Retrieved February 10, 2018 from https://www.riskmethods.net/en/software/overview. UPS. (2018). Retrieved February 11, 2018 from https://www.youtube.com/watch?v=aYoNd2nQqLg. Wilkinson, G. (2018). Integrating artificial intelligence with simulation modeling. Retrieved February 11, 2018 from https://www.anylogic.com/blog/.